I think Chicken Parmesan is one of the most universally loved foods, and for good reason. 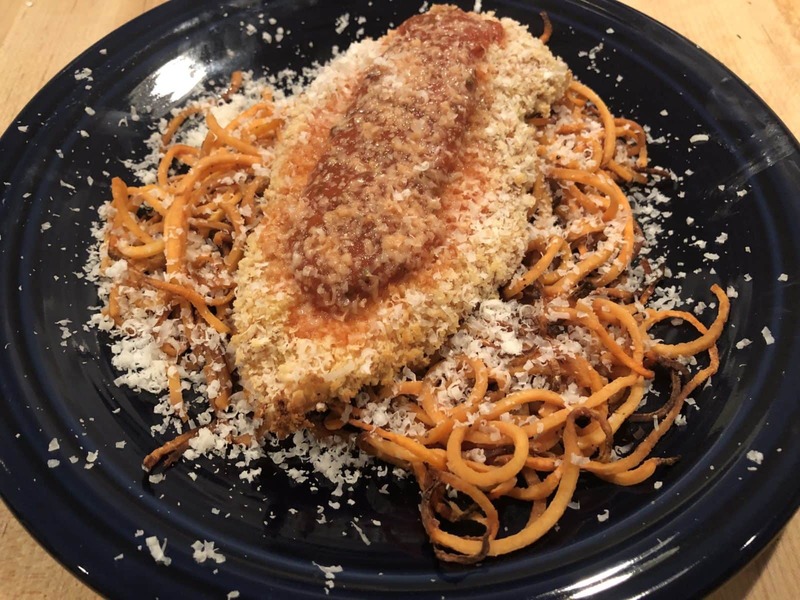 Crunchy, salty, cheesy, saucy, and oft married with pasta, its about as perfect as a food can get… except that it can take a very long time to prepare, its deep fried, and it is mostly white carbs. In separate plates, combine the cornstarch, beaten eggs with a splash of water, and panko bread crumbs. Spray large baking sheet with cooking spray. Season chicken with garlic powder, onion powder, paprika, salt and pepper. Bread chicken in cornstarch, eggs, and then panko, always shaking off the excess. ** Place on large baking sheet, spraying the tops of the chicken with cooking spray, and insert into oven. Bake for 12-14 minutes, or until golden brown. Place the veggie noodles on a large baking sheet, season lightly with salt and pepper, and bake for 15 minutes, stirring halfway. Once chicken is browned, top each piece with a bit of sauce and cheese and bake for another 2-3 minutes. Serve immediately over the noodles with more sauce as cheese as desired. *Gluten free? Use Corn Flakes, they work equally as well.